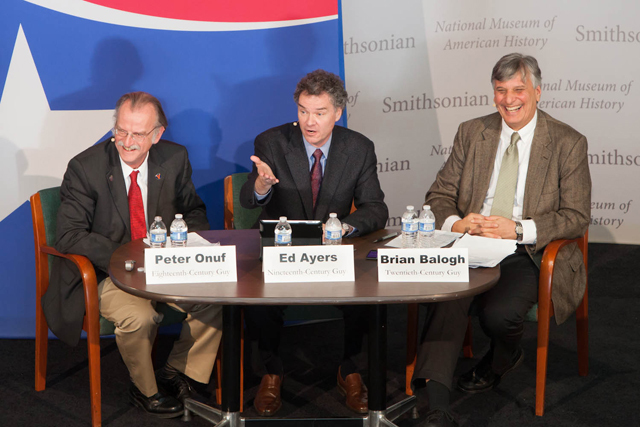 As part of the many events taking place in Washington, D.C. in the days leading to our country’s 57th inauguration, the National Endowment for the Humanities and the National Museum of American History co-hosted “BackStory, on Presidential Inaugurations.” Three men who call themselves the American History Guys led a presentation on the mostly orderly, sometimes somber, and once in a while raucous history of inaugurations. Each man is an expert on their own century of American history. Onuf covers the 18th Century, Ayers the 19th, and Balogh the 20th. During the live presentation at the National Museum of American History, the History Boys discussed inaugurations around a live audience gathered in front of them, often taking questions from the people listening in front of them. The American History Guys at their presentation. The event began with the question: “Really, inaugurations? That big a deal?” According to them, the answer was yes; an inauguration can set the tone for a president’s term. President Jackson’s inauguration apparently ended with a disorderly party at the White House where attendees barged into the house. President Roosevelt’s first inauguration occurred in the middle of the Great Depression, and honored the somber economic climate with a more muted celebration. BackStory with the American History Guys bobbleheads. If you missed the event on Jan. 19, take a few minutes to watch this video of highlights produced by AS Productions and Boston University Center for Digital Imaging Arts. The video will provide not only a taste of “BackStory on Presidential Inaugurations,” but the entire inaugural weekend as well. For more information on the American History Guys, visit their website. For more on the 57th inauguration, there is still the “Inauguration Station” research portal. The portal provides information on past Presidents and their inaugurations, First Ladies’ fashion styles, inaugural customs, and more. Its creation was a collaborative effort of the National Endowment for the Humanities, the National Endowment for the Arts, the Institute of Museum and Library Services, the National Archives, the National Museum of American History, and the Library of Congress. This entry was posted in Uncategorized and tagged 57th inauguration, AS Productions and Boston University Center for Digital Imaging Arts, BackStory on Presidential Inaugurations, BackStory with the American History Guys, Barack Obama, community, culture, education, events, history, inauguration, National Endowment for the Humanities, NEH, NEH Office of Congressional Affairs, Presidents, resources, The American Histroy Guys, Virginia Foundation for the Humanities by nehblog1. Bookmark the permalink.